Uncontrollable bleeding? Yes. Mild earache? No. If you go, here are ways to make the visit less stressful. It’s a place no one wants to end up: the emergency room. But according to Dr. Gregory Schroedl, an emergency medicine physician and chief medical officer at Northwest Hospital & Medical Center, if you are headed to the emergency room, there are several things you can do to make your visit more efficient and less stressful. Dr. Greg Schroedl is chief medical officer at Northwest Hospital. The name says it all. Emergency Departments are designed to care for you in an emergency, which means a life-threatening illness or injury that requires immediate treatment. If you have a medical problem that cannot wait until you can make an appointment with your primary-care provider or that is too severe to be treated at a walk-in or urgent care clinic, then a visit to the nearest emergency room is appropriate. Heavy, uncontrolled bleeding is an example of an emergency. A mild earache is not. How you get to the emergency room is as important as why you go. “It is important that if people have acute symptoms such as shortness of breath, chest pain or the symptoms of stroke, they should call 911 and not try to drive to the emergency department themselves,” said Schroedl. ERs, as emergency rooms are commonly called, operate on principle known as “triage.” Patients are treated based on the severity of their injury or illness — not necessarily on first-come, first-served. If you’re waiting to be evaluated and your symptoms get worse, notify the triage nurse or a member of the ER staff. A UW Medicine nurse cares for a deaf patient with assistance of American Sign Language (ASL) medical interpreter over remote video. The ER staff works as a team. You’ll be seen by a physician who specializes in emergency medicine, as well as nurses and technicians. Other specialists may be called in to assist with your care if your condition warrants it. Once you are in a treatment room, it is important to follow any instructions you are given, especially regarding food and beverages. Patients often are not allowed to eat or drink until after their ER visit because some tests and procedures cannot be performed if the patient has consumed food or drink recently. When patients are elderly or cognitively impaired, it can be helpful — even essential — for a family member or caregiver to remain with them throughout their treatment. “In general, any patient in our hospital’s emergency department can have family members or other visitors with them, though we try to limit them to no more than two, due to the size of the treatment rooms. We leave it to their own discretion whether they want their visitors to stay or step out of the room during an examination or the administration of care,” said Schroedl. How long you spend in the ER depends on the kind of care you need to stabilize your condition and the types of diagnostic tests your physician orders. The entrance to the Hancock Emergency Services Pavilion at Northwest Hospital & Medical Center in north Seattle. 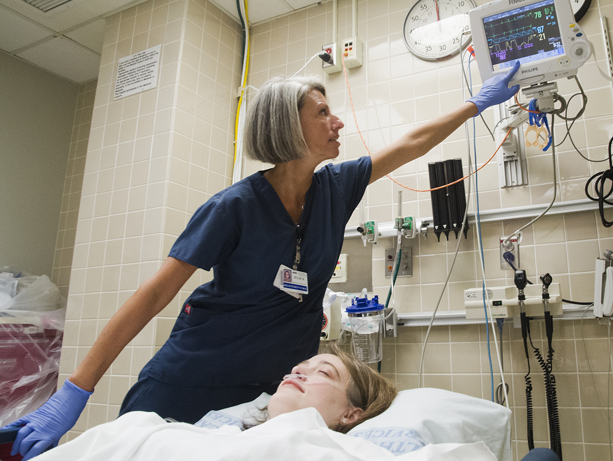 “In the emergency department, we always do our best to assess any and all issues the patient feels are urgent and decide how the emergency department can take care of them most effectively,” said Schroedl. If your condition warrants ongoing care, you will either be admitted to the hospital or given a referral for treatment at your primary-care clinic or a specialty clinic. Extremely complex care needs — such as a major fracture, burns or pediatric treatment — may be referred to a specialty medical facility. You make be transported to another hospital that can better manage your case. Whether you are admitted to the hospital, given a referral for follow-up care or sent home to recover, before you leave, talk with the ER staff to make sure you understand your diagnosis, your treatment plan, how and when to take any new medications, symptoms to watch out for, and steps you need to take after you get home, such as making a follow-up appointment with your primary-care provider or a specialist. If you are confused or don’t understand all of the instructions, it is very important that you ask for clarification. The last thing you want is to find yourself back in the ER with the same — or even worse — symptoms.